Okay. It might sound surprising. But even in wintertime, when temperatures are freezing and snow is only the first day really glitzy and shimmering, it’s worth to spend a couple of days in Berlin. On the one hand, of course, you still can spend hours and hours of driving around with Driverguides Berlin to get the full perspective of Berlin out of the car, seat heating and panorama roof included… by the way, we’ll definitely show you the nicest parks and most beautiful snow-places in town. How the residence shifted to the centre of Berlin. 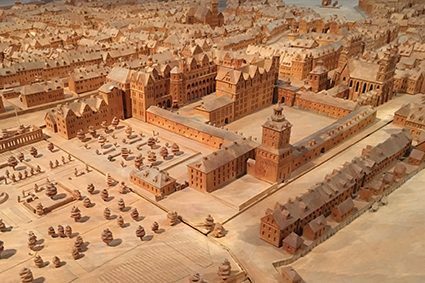 And how Berlin grew with its palace. Careful and beautiful designed city models. A nice and easy understandable overview of how in the midth of the 17th century immigrants and Berliners, how religious tolerance and economical openess made the city growing. Beside that, nice stories about daily life in Berlin. Or did you know that the installation of oil lamps in front of every third house of Berlin in 1679 caused a long and controversy discussion comparable with todays battles about video surveillance? After not even an hour you understood the importance of this palace to Berlin. How it has shaped the perspectives in the city, in a visual as well as intellectual way. And maybe yours as well. So this is something you might discuss with your personal driverguide continuing your individual tour through Berlin in this cold but beautiful January.